NOTE: On Sept. 14 – 17, activists with the Freedom not Fear movement will stage an international week of action to oppose various forms of surveillance. EFF is spending this week examining surveillance trends and spotlighting movements that have sprung up in opposition. You can follow our series here. In June of 2012, a grand total of eight violent crimes were recorded in the sleepy town of Royston (pop. 14,570), a Hertfordshire, England community best known for having a volunteer brass band and an historic cave dating back to medieval times. Ranked as a low-crime area by UK Crime Stats, Royston has nevertheless landed at the center of a raging controversy about the extraordinary security measures in place. All around the small town, closed-circuit television (CCTV) cameras are trained on the streets, programmed to automatically record the plate numbers of each and every automobile passing through. Freedom Not Fear, an international week of action that’s being staged in Brussels Sept. 14 through 17, will feature a number of meetings and events drawing attention to growing and ubiquitous CCTV surveillance. Organizers from No-CCTV, a group that’s challenging the Royston ring of steel, and others hope to use Freedom Not Fear to raise awareness about the growing deployment of surveillance technology, launch creative responses, and identify solutions for reversing the trend. 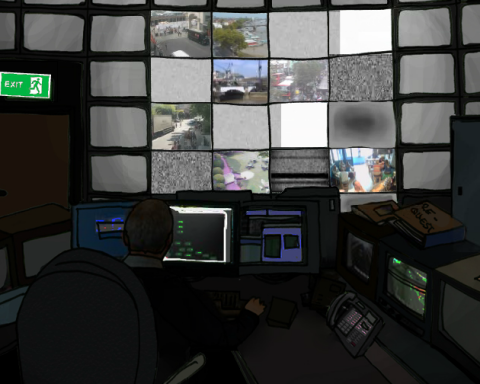 Screen Shot from “We Watch” website, a project focused on surveillance in London. On Sept. 15, Freedom Not Fear activists will hold a meeting to discuss coordinating international responses to surveillance cameras, particularly in the face of new developments in surveillance technology. Law enforcement in the UK recently unveiled the use of an app called Facewatch to track down low-level offenders. It utilizes footage showing people’s faces, captured via surveillance cameras, to create a database of suspects. The database is then made publicly available to anyone who downloads the app with a mobile phone. In a bizarre and highly problematic use of crowdsourcing, members of the general public are asked to sift through the collection of photographs and send identifying information about anyone they may recognize to the police. “Scotland Yard says it has loaded its ‘Facewatch’ app with nearly 5,000 pictures of suspects wanted either in connection with low-level crime or the summer riots which hit the capital last year,” notes a report in the Associated Press. Organizers of anti-CCTV events at Freedom Not Fear say mounting a response to the privacy-invasive Facewatch program ranks high on the agenda. “We are concerned about the growing use of CCTV cameras to produce wanted posters, and together with other campaigners at Freedom Not Fear in Brussels, we will discuss the Facewatch system in the UK - and hopefully produce a statement/decision from an International Surveillance Working Group,” says Charles Farrier from No-CCTV UK. While No-CCTV has lodged a number of formal complaints responding to massive CCTV deployment projects initiated by law enforcement, other forms of anti-surveillance camera activism take a more creative approach. On Sept. 15, for example, a group of activists plan to lead a “camspotting” excursion through Brussels. As part of the exercise, activists will go out into the streets of Brussels, snap photographs of every CCTV camera they find, write down the location, and collectively plot them on an interactive map. Datapanik and the Flemish League of Human Rights started a project of plotting all visible surveillance cameras in various locations in Belgium, and hope to build upon this effort. On June 8, anti-CCTV activists staged an international “1984 Action Day” – timed to coincide with the publication anniversary of George Orwell’s classic novel – to call attention to the surveillance cameras gazing from every direction at ordinary citizens going about their daily business. The day marked the launch of a website called We Watch, developed by German designer Julia Lowczycka, that educates the public about surveillance in London via a flash graphical interface called Maupa's World. In Birmingham (UK), campaigners ventured out on a wet and windy day to ask shoppers if they wanted to buy photographs of themselves -- which had already been taken without their permission by CCTV cameras as they walked through the city center. The shoppers who stopped to find out more were shown a portfolio of CCTV images, and asked to consider whether they thought it was acceptable that they are constantly filmed as they go about their daily business. In Berlin, around 40 campaigners took a surveillance walk around the city, and a group called Out of Control Berlin screened short films documenting the growing CCTV phenomenon. The "Leipziger Kamera" was another German citizens' initiative against CCTV. "The paper basket workshop sounds funny, and it is, but there is a serious background," says Michael Ebeling, part of the German Working Group On Data Retention Hanover. "Human beings need place and time free from any surveillance to develop to individual personalities, to grow as autonomous and discrete thinking characters. Therefore surveillance is like poison for ... society as long as we believe in democracy and humanity. Surveillance-free public spaces need to be preserved, CCTV-infiltrated ones to be recaptured. That is our right as free citizens!" A report released by Big Brother Watch in February of 2012 details how local law enforcement agencies spent $515 million on CCTV in four years. The report found that there are at least 51,600 CCTV cameras controlled by 428 local authorities in Britain, and a 2002 study pegged the total number of CCTV cameras in the UK at around 4.2 million. In London, it’s estimated that on average, more than 300 different cameras might record an individual throughout the course of a single day. Despite the intensive resources devoted to CCTV, there is a body of evidence demonstrating that the surveillance measure actually does little to deter crime. UK resident Cory Doctorow, writing in an editorial in The Guardian, also seized on this point. “Although study after study has concluded that CCTVs don't deter most crime (a famous San Francisco study showed that, at best, street crime shifted a few metres down the pavement when the CCTV went up), we've been told for years that we must all submit to being photographed all the time because it would keep the people around us from beating us, robbing us, burning our buildings and burglarising our homes,” he writes. But EFF alongside activists from Big Brother Watch, No-CCTV, Privacy International, Datapanik.org, The Flemish League for Human Rights, Arbeitskreis Vorratsdatenspeicherung" (a Hanover chapter of the German Working Group on Data Retention) and others aren’t buying into the argument that privacy should continue to be sacrificed for a false sense of security. And during Freedom Not Fear, it’s the crowd that will be focused on the camera.